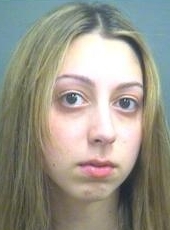 BOCA RATON – Florida Highway Patrol charged a 20-year-old Boca Raton woman with two counts of negligent manslaughter and drunken driving relating to a fatal car accident that killed two people. Daniela Torres was arrested Monday afternoon following a six-month investigation into the crash, which happened on Interstate 95 near Palmetto Park Road in August. Torres was on her way home from work at a restaurant in Fort Lauderdale and driving about 85 mph when she changed lanes and rear-ended a slower-moving sedan driven by James Andrew Carr, 42. Torres’ Saab pushed the sedan onto a grass shoulder, and it overturned. Carr and passengers Deborah Peterson, 44, and Calvin Braggs were ejected. Carr and Peterson were killed. A witness said she was weaving from the outside lane to the center lane when she hit the sedan. This morning at her first appearance before a judge, Torres did not speak. Judge Howard Harrison ordered her held in lieu of $50,000 bail, $25,000 for each of the deaths as well as supervised release. He also forbade her to drink alcohol or to drive. According to the Illinois State Police drivers under age 21 represent 10% of licensed drivers but are involved in 17% of alcohol-related fatal crashes. The Florida Constitution provides that in a situation such as this a Defendant is entitled to a “reasonable” bond. When determining what a reasonable bond amount is a judge will usually consider some of the following. What “ties” to the community does the defendant have? For example, has the Defendant lived in Florida for several years or is the Defendant a transient? Does the Defendant own a home in the community? Does the Defendant have family ties to the community? These are just a few things that a Judge will examine before determining what a “reasonable bond” may be. Richard Ansara is a Broward County Criminal Attorney. He is the head attorney of the Ansara Law Firm located in Fort Lauderdale, Florida. The Ansara Law Firm handles Felony and Misdemeanor cases in Broward, Dade, and Palm Beach County. If you have any questions and would like to speak with Criminal Defense Attorney Richard Ansara about your case please call (954) 761-4011.